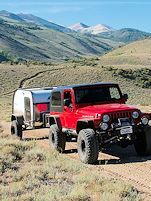 Teardrops n Tiny Travel Trailers • View topic - Sonora Pass (HWY 108)...can you tow a trailer? Sonora Pass (HWY 108)...can you tow a trailer? This may be a dumb question...but have people taken their teardrops over Sonora pass (northern CA)??? 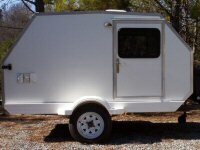 For info, we have a 5x8 TD with brakes and we tow it with a Ford Ranger pick-up. I know trailers are not 'recommended', as I have driven the pass in my car and seen the signs, but is it safely do-able with the TD trailer? I have researched online about taking trailers across HWY 108 (and alternatively HWY 4/Ebbetts Pass) and have seen the 'oh my god no freaking way' response and others who have done it in large 5th wheels! We had to drive on 120 through Yosemite on a Saturday in June coming back to the Bay Area from the Eastern Sierras and we would prefer to NEVER have to do that again. Between all the clueless drivers that just slam on the brakes for no reason or swerve into on-coming traffic and the pedestrians just walking in the roadway, it was a very stressful drive! Plus, the 30-45min wait in line just to get into the park!!! It was bad planning on our part, but a learning experience. HWY 108 is the next best option for the Bishop/Bridgeport/Big Pine area we like to frequent, so I was hoping for some feedback from those with experience. Re: Sonora Pass (HWY 108)...can you tow a trailer? We pulled our Midget over Ebbots Pass a few years ago with our full size truck and had no issues at all. It gets down to one lane at the top but there was hardly any traffic mid week and there is plenty of room to pass. We attended last years Beat the Heat run up on Sonora Pass and I know Jerry here on the board towed his TD over the pass. Maybe he will chime in on this thread. The secret is the tow vehicle, if you have a less than antiquate TV you will get yourself in trouble both going up and down as both sides have 26% grades for the first and last 1/2 mile or so. I have seen people with not enough power to going up stalled, and smoking brakes going down. A manual trans is best with good torque/power and good braking technique coming down. As we spend as much time on the eastern side of the Sierra's or Nevada as we can we travel over Sonora pass a lot. Six cyl. Jeep with 35" tires and 1700lb trailer with brakes are no problem. It's just a little slow at the top at the steepest grades. Hi Lisa. Sorry for the late reply. I did the Hwy. 108 Sonora Pass last August in my 03 BMW 325 with a 5 speed manual transmission. It was not that bad. As someone else mentioned, having a manual transmission helped to keep the drivetrain engaged vs. the slipping torque converter on a automatic. My brother was behind me in his older Ford Explorer which is pretty much like your Ranger and he made it fine. If your vehicle is up to par, your should be fine with a small teardrop in tow. Just use your gears to keep you brakes from getting hot and try to keep up your momentum and anticipate the road ahead.